The continued and rapid advancement of modern technology now allows scientists to collect data of increasingly unprecedented size and complexity. Examples include epigenomic data, genomic data, proteomic data, high-resolution image data, high-frequency financial data, functional and longitudinal data, and network data. Simultaneous variable selection and estimation is one of the key statistical problems involved in analyzing such big and complex data. The purpose of this book is to stimulate research and foster interaction between researchers in the area of high-dimensional data analysis. 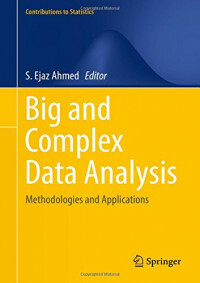 More concretely, its goals are to: 1) highlight and expand the breadth of existing methods in big data and high-dimensional data analysis and their potential for the advancement of both the mathematical and statistical sciences; 2) identify important directions for future research in the theory of regularization methods, in algorithmic development, and in methodologies for different application areas; and 3) facilitate collaboration between theoretical and subject-specific researchers.